Speaking at the United National Congress’ (UNC) Monday Night Forum at the Carapo Roman Catholic Primary School, the Prime Minister reiterated that her Government — despite cries from MATT that the media is under attack — has had very cordial relations with the media. “I want no war with the media! Over the years, I am proud to say I have built relationships and consider members of the Fourth Estate (the media) as patriots, who work hard despite the lack of financial gain to help build a functioning and successful democracy,” she said. The Prime Minister said she was not afraid of calling on the media to report the news fairly and accurately. “I am not afraid of taking the risk associated with saying the following, which by no means should be construed as an attack on the media freedom. 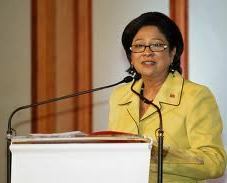 But the evidence before me is troubling and it should trouble all of us as citizens,” Persad-Bissessar said. The UNC political leader said that the Fourth Estate, as journalism is also known, is in itself a political force in any democracy. She said that the media’s integrity is based on being fair and unbiased. “And when that integrity is under attack by a few rogue elements within the profession, we are all at risk…no matter what side of the political divide you stand on,” she added. “They have now resorted to even distorting the facts. In the interest and cause of good journalism and journalistic integrity, we need to take the profession of reporting to newer heights of personal and institutional professionalism and excellence.” The Prime Minister told the large crowd that the duty of the local media is to inform and educate but equally, to be fair and truthful. Freedom of the press, she reminded, is constitutionally guaranteed and her Government operates under the tenets of the Constitution. The Prime Minister’s call came less than a week after D’Abadie/O’Meara MP and Sport Minister Anil Roberts, last Thursday, publicly said that the Guardian newspaper printed an untruthful story that the Integrity Commission had referred him to the Director of Public Prosecutions (DPP). Roberts, at last week’s post Cabinet press briefing, also said that as a result, he has sent pre- action protocol letters to Guardian editor-in-chief Judy Raymond and reporter Anika Gumbs- Sandiford. Last night, prior to the Prime Minister’s feature address, Roberts took to the podium and again raised the issue of the Guardian story, calling on the media to hold itself accountable even as it seeks to hold those in office accountable. She said that those who attack her Government are not interested in nation-building but in attaining power by any means necessary. Saying that her People’s Partnership was at its mid-term, she said Government has experienced a steep learning curve with no honeymoon. “Our detractors have tried to disrupt the economy by strikes and marches. Tyres have been burning all across the country’s streets. Roads have been blocked disrupting economic activity and creating moments of chaos,” she said. “In all of this, I have been patient, exercising great forbearance as we continue our agenda of transforming communities and by extension, the lives of our citizens. My patience is motivated by the fact that I understand the frustrations of our citizens,” she said.